Manchester City Council has made the call for people to stand together against hatred and prejudice during Hate Crime Awareness Week. 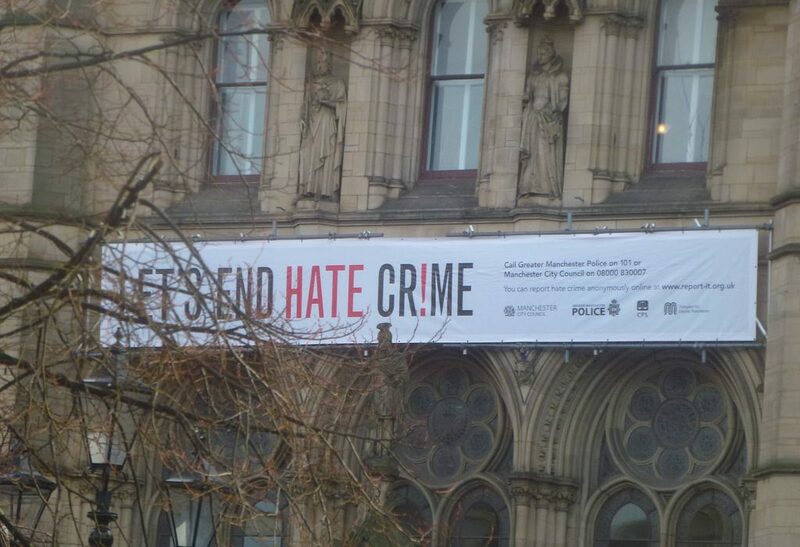 Hate Crime Awareness Week was launched on Monday 4th February, and ran until Sunday 10th. More than 100 events took place across Greater Manchester to encourage people to learn more about hate crime, and how to tackle it. Hate crimes strike at the core of a person’s identity. Hostile acts involve but are not limited to: violent or verbal abuse, spitting, harassment, and damage to property, for reasons such as race, faith, sexual orientation, or disability. Manchester City Council declared: “It is unacceptable in 2019 that such crimes can still take place.” In a pledge to ensure that Manchester is a city of acceptance, the council is taking extra measures to root out perpetrators of hate crime. Yet despite progress made by the authorities over the past few decades, there is still room for improvement. Hate crime cannot be tackled by the police services alone, which is why the council are asking communities to avoid turning a blind eye if someone is a victim of a hate crime. Jamie Whittaker, 38, from Levenshulme, was a victim of a homophobic assault that took place two weeks ago. Enjoying a night out in Albert’s Schloss, he was verbally and physically attacked when leaving the venue. Whittaker’s assault is a prime example of hate crime that takes place across the city of Manchester. In an attempt to reduce the number of hate crimes, such as that against Mr. Whittaker, the council are calling on the citizens of Manchester to make the ‘Greater Manchester Promise’. They are asking Mancunians to support anyone who is abused, challenge their abuser (if it is safe to do so), and report any crimes witnessed. Murphy has faith that the Mancunian solidarity and spirit will shine once again when joining forces to support, challenge, and report in an ongoing fight to rid the city of hate crime. Reporting hate crime is easy. You can do it online here, call the police on 101 or, at one of dozens of independent reporting centres across Greater Manchester.